I often seem to get dragged along to local markets on mornings when I have no business being awake or even attempting to interact with others, but these always seem to be where I find really interesting small businesses that end up fascinating me. This was definitely the case one morning last year while visiting the Horsefeather’s Market on the West Side of Buffalo. Amongst the produce vendors, small shops selling coffee and handmade dumplings, and an interminably busy brunch spot — was a small table piled with tiny boxes hiding treasures. You could have easily walked past it if it weren’t for the electric colors of the actual product drawing you in. These simple and unassuming cartons were filled with selections of glossy Technicolor chocolate truffles — bright blooms of gold, red, and purple, bisected asymmetrically by a single bold line of color. A metallic dusting leaving them looking a little a starry midnight sky. But don’t for a second think that these truffles are too precious or delicate to eat, their intensity of flavor and uniqueness demands that they be sampled. And honestly, all this romanticized and pseudo-poetic language about chocolates is coming from someone like me — WHO DOES NOT LIKE SWEETS — so you know they have to be pretty good. 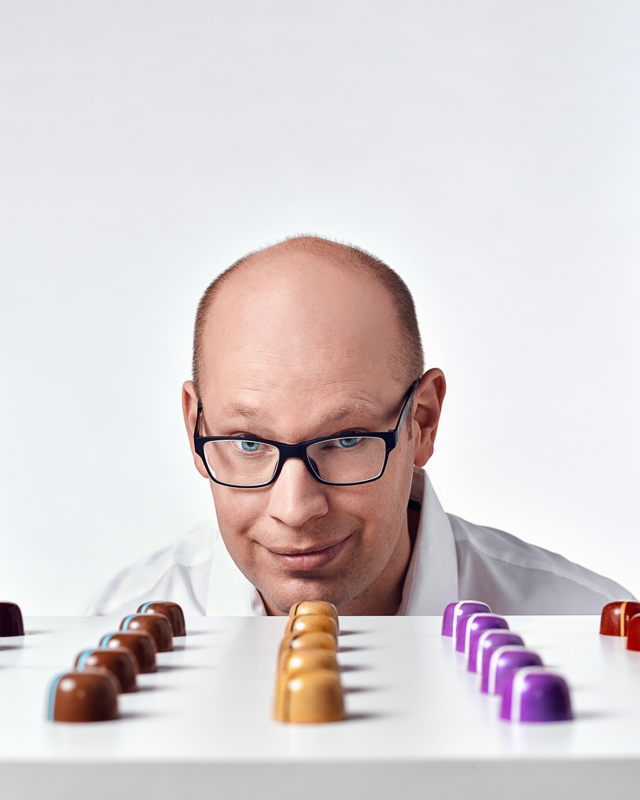 The man making and selling these chocolates is Ben Johnson, the owner of Blue Table Chocolates, and he got his start in chocolate as a way to fill his days while looking for a job. Ben came to Buffalo from Boston, MA, where he had been working for over a decade in the non-profit sector with an initiative focused on building affordable housing. Ben’s wife was the catalyst for a move when, as an academic, she was offered a job teaching at the University of Buffalo. “I started looking for the same exact thing here and it wasn’t coming up. So just to fill the day I got a job working at Choco-Logo on Broadway downtown, worked there for about three months, just working the line along with Buffalo’s Burmese community and just got hooked, just got totally hooked until I got another desk job, and you know, ‘say good‑bye, this was fun, you know, take care, guys, I’ll see you around, but I have to go back to my real life now.’ But I never really stopped.” Ben told me. It may be a harder road to walk, but by eschewing trends and chasing what interests him, Ben has begun to carve out a loyal following — amongst both fellow obsessives and casual fans. Each season brings a constant evolution and refinement of Ben’s truffles, which he still produces by hand himself. Blue Table Chocolates have become something of a treasure to those that love them — something they will gladly seek out as they follow Ben’s market schedule, order directly from him, or even by opting to one of the subscription plans that Ben offers that featuring both his classic and special monthly flavors. Speaking for myself, it’s the uniqueness of the flavors that Ben creates that drew me to his chocolates — And while you won’t find sponge candy or other classic local favorites amongst his wares, you can be sure that Ben is awake, probably much later than you are, and working on something even cooler to excite you.